Attention graduating seniors and their parents (and anyone who is planning to attend college or a vocational school this coming school year)! Submitting the FAFSA is the first and most important step of applying for grants, scholarships, and other funding opportunities for college and vocational training. 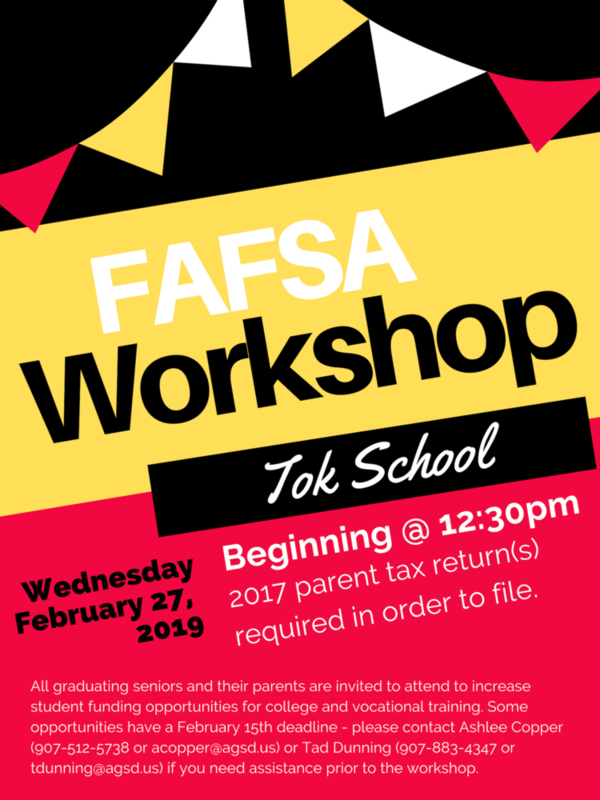 UAF is partnering with AGSD to hold a FAFSA Workshop at Tok School beginning at 12:30pm on Wednesday, February 27th. Please note that some colleges and funding opportunities require the FAFSA to be submitted by February 15th - if you need support in completing your FAFSA prior to the workshop, please contact Ashlee Copper (907-512-5738 or acopper@agsd.us) or Tad Dunning (907-883-4347 or tdunning@agsd.us).